I've often blogged about the Burlington Antique Fair at the Boone County Fairgrounds in Burlington, KY. 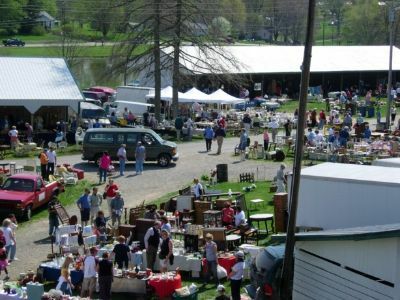 This notable Antique Fair with over 200 vendors, runs every 3rd Sunday of the Month from April through October each year. This year, the last show will be held on Sunday, October 21st, so be sure to mark your calendars. "100 Things to do before you die" The Cincinnati Enquirer, June 17, 2008 - " # 51 - Show up at 5 a.m. on Sunday to find the best deals at the Burlington Antique Show at the Boone County Fairgrounds." Today I wanted to alert those of you die hard antiquing fans that the "Market Warriors" PBS special will be prem iering on WCET on Monday, October 15th at 9:00 pm. This show was actually filmed on location at the Burlington Antique Fair last May when the "market pickers" (Miller, John, Bob and Kevin) were sent out to find unique "lighting" pieces. What they found will be auctioned in Los Angeles, CA at the A.N. Abel Auction Company. I wonder what our Burlington, Kentucky bought antiques will actually be worth on the West Coast! I have a feeling it will be a lot more than they paid for here in Burlington! Be sure to watch the premiere on October 15th! 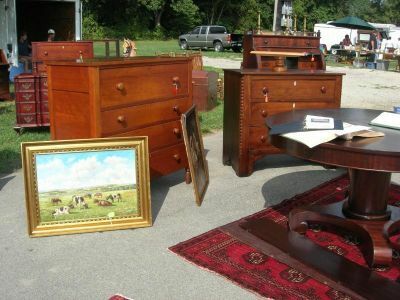 For those of you who may be interested in the last official Burlington Antique Show of the year, the Boone County Fairgrounds are located at 5819 Idlewild Rd in Burlington, KY. Just head west on Rt. 18 from the Florence Mall about 5 miles until you reach the stop light at Jefferson. Turn right on Jefferson (also known as KY 338). The Fairgrounds are just around the bend on the left. Admission is just $3.00 per person from 8:00 am - 3:00 pm and $5.00 per person for the early bird entrance from 6:00 am - 8:00 am. If you end up finding a lot of great deals at the Burlington Antique Fair, who knows....you just may need a new home to showcase your finds! Take a look at the current Burlington listings below to see if you can find yet another great gem!